Mitsuhide Takechi, who could not stand the humiliating treatment he received from his master, Harunaga Oda, killed his master at Honnoji Temple, and then confronted the army led by Hisayoshi Mashiba, who was returning from an attack on Shikoku. 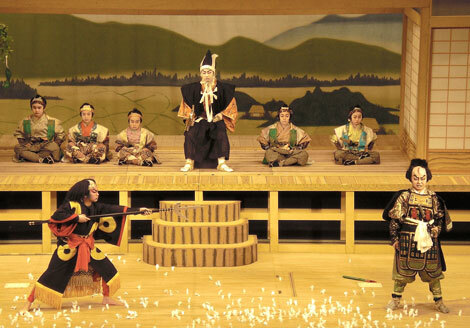 The scene takes place during the battle at a the house to which Mitsuhide’s mother, Satsuki, retired to become a nun in a bamboo forest. Satsuki had broken off relations with her son, Mitsuhide, since she did not like the fact that Mitsuhide had killed his master, with whom they had had a good relationship for three generations. Satsuki’s grandson, Jujiro, was visiting her to say goodbye since he was going off to join in his first battle. Jujiro’s grandmother, Satsuki, and his mother, Misao, conducted the marriage of Jujiro and his fiancé, Hatsugiku, and then sent him to the battlefield. Mitsuhide was chasing Hisayoshi and came out of the bamboo forest at the retirement house. He plunged the head of his spear, a weapon with which Mitsuhide was very skilled, into a room of the retirement house. However, what Mitsuhide’s spear plunged into was not Hisayoshi, but his own mother. Mitsuhide was shocked and full of regret; however, Satsuki was brave enough to remonstrate her son even though she had been stabbed, over the mourning of Misao. Before long, the critically-injured Jujiro came back from the battlefield and informed everyone of the defeat of their army. Appearing in front of Mitsuhide, who was driven into a corner, Hisayoshi and his subordinate, Masakiyo Kato, let Mitsuhide go after having made a commitment to meet him again at Tennozan. The scene ends.